The Bonita Queen - WEEKLY and MONTHLY RENTALS! As the largest floor plan in Bonita Village this Great Room Plan is an exciting place to live. It is so beautifully decorated everyone is delighted with their accommodations! The huge Open Kitchen will remind you of home! The split bedrooms leave plenty of space between you and your guests. 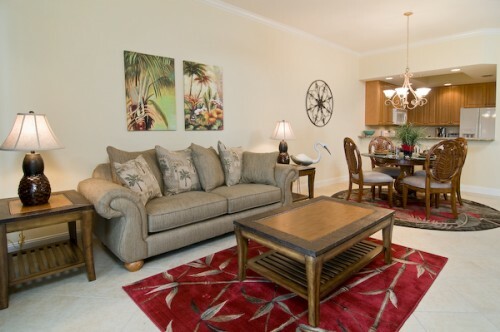 Of course, Bonita Village has special amenities and is only 180 seconds from the Gulf! Call us today with your questions and get ready to enjoy a fine residence, a superb community and the perfect location right in the center of everything you will want to do when in Florida! Stop by our office at 4445 Bonita Beach Rd., Ste 158-160 (next to Sweet Melissa's Homemade Ice Cream) to see dozens of activities available in the surrounding area! The whole family will enjoy Bonita Village! Just Call Pat! (239) 707-9163. 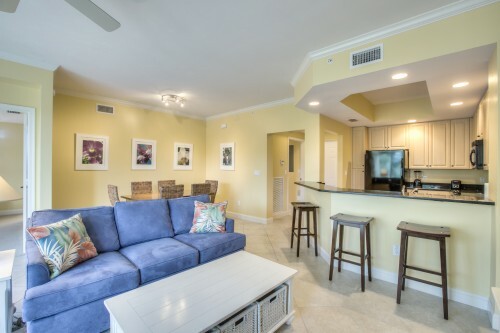 MY PENTHOUSE PARADISE at Bonita Village - WEEKLY and MONTHLY RENTALS! 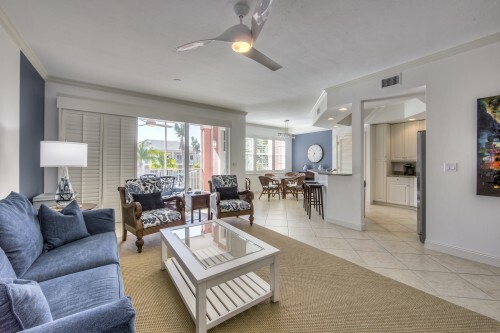 My Penthouse Paradise may be the nicest one bedroom in the Bonita Beach area! 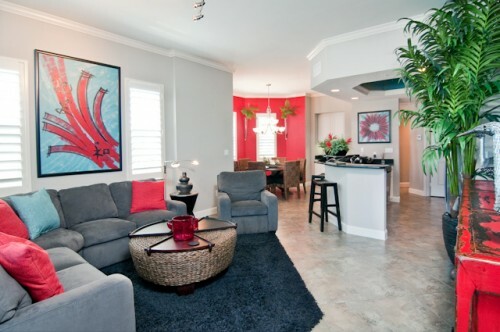 Plus, it is hard to beat the casual, upscale living offered at Bonita Village. This unique vacation destination is close to everything! You can be at the water's edge of the Gulf of Mexico in as little as 180 seconds, or be shopping at Coconut Point Mall, South Florida's largest new mall, in 10 minutes. Golfers, pick up our list of Public and Semi-private golf courses at the Welcome Center, on Bonita Beach Road, just west of U.S. Hwy. 41. Boaters are only 60 seconds away from a great time on the water! 'JUST CALL PAT' to make My Penthouse Paradise your next vacation residence! 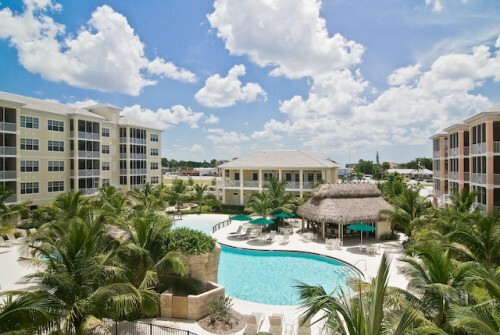 PALM PARADISE in Bonita Springs - WEEKLY and MONTHLY RENTALS! Palm Paradise is a tastefully decorated one bedroom with a spiral staircase leading to a private patio. Steps from the private patio is the Quiet Pool and spa. It is hard to beat the casual, upscale living offered at Bonita Village. This unique vacation destination is close to everything! You can have your feet in the Gulf of Mexico in as little as 180 seconds, or be shopping at Coconut Point Mall, the largest new mall in Southwest Florida, in 10 minutes. Golfers, pick up our list of Public and Semi-private golf courses in our office on Bonita Beach Road at 4445 Bonita Beach Rd., next door to Sweet Melissa's Homemade Ice Cream! Boaters are only 60 seconds away from a great time on the water! 'JUST CALL PAT' to make Palm Paradise your next vacation residence! Our Crown Jewel of Bonita Village - WEEKLY and MONTHLY RENTALS! This exquisite, close to the beach hide-a-way features 2 Bedrooms, 2 Baths, and a beautiful view. Enjoy the open kitchen, granite tops, crown moldings, under building parking, and climate controlled storage! You'll meet everyone at the Chickee, which has 2 Big Screens and serves lite fare in Season. Take the 'for residents only Beach Shuttle' by appointment to Bonita Beach. The Southern Exposure, gorgeous furnishings, big lanai, and Plantation Shutters will accommodate the most discriminating vacationer! Just Call 'Pat' Scott at 239-707-9163. The Sunshine Palace - WEEKLY and MONTHLY RENTALS! If you are like us, a PERFECT VACATION RESIDENCE should have these 9 Vacation Necessities! 1.) A Fabulous Beach, 2.) A Huge Pool 3.) A Gorgeous Residence! 4.) A Beautiful Community 5.) A Sensational Clubhouse 6.) A Poolside Chickee 7.) Fun People 8.) Fun Activities Closeby and, 9.) Gorgeous Sunsets! 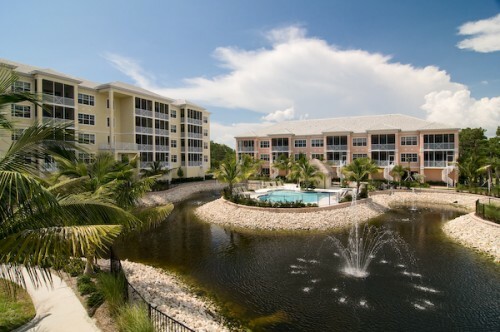 Check out THE SUNSHINE PALACE at Bonita Village to enjoy it all! Bonita Village will match your mood as you feel the freedom to relax, socialize, explore or exercise anytime! 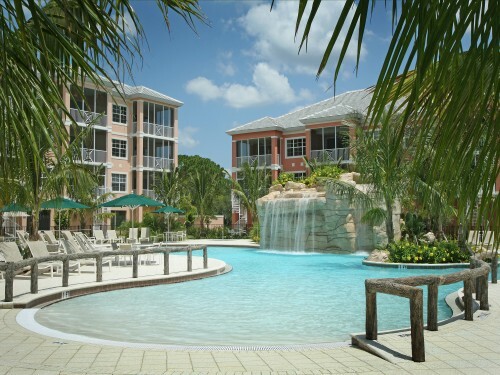 This casually upscale, vacation-styled condominium community is close to everything you will want to do in Florida. You can have your feet in the warm sands of Bonita Beach in as little as 180 seconds or be shopping at Coconut Point Mall, South Florida's largest open air mall, in 10 minutes. 'JUST CALL PAT' for answers to your questions or to reserve your stay. 239-707-9163. My Poolside Hide-a-way - WEEKLY and MONTHLY RENTALS! As we know, a successful vacation starts with where you stay! 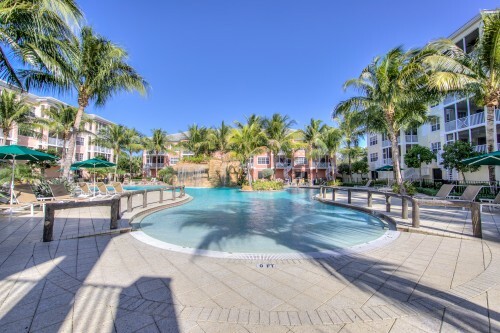 'My Poolside Hide-a-way' near Bonita Beach has the View and Access to the Resort Pool, and the Central Location to make your holiday vacation one to remember. As manager of the property for years, this is the residence my family wants when they come to visit. The split bedroom plan, private access to baths, ample closets, open kitchen and Big Screen TV makes is fun and relaxing. To 'Live the Life Out of Every Day' while you enjoy your vacation. So, 'Just Call Pat' at 239-707-9163 and we will see you soon! My Great Escape - 2 Bedrooms/2 Bath - This Gorgeous Residence is FOR SALE or RENT. Weekly and Monthly Rentals provide extra income for a flexible owner! Beautifully decorated and comfortable appointed for the ideal vacation. Enjoy all the necessities of home so you can focus on making memories and relaxing by the Resort Pool with a scenic waterfall. The split bedrooms leave plenty of space between you and your guests. Of course, Bonita Village has special amenities and is only 180 seconds to the Gulf! Call us today with your questions and get ready to enjoy a fine residence, a superb community and the perfect location right in the center of everything you will want to do when in Florida! Stop by our office to hear about dozens of activities available to you in the surrounding area! Remember, Just Call Pat! (239) 707-9163. When sold a New Owner will honor all leases. Castle Lola - WEEKLY and MONTHLY RENTALS! The Southern Exposure and tropical Resort Pool view is the perfect start of an unforgettable vacation! This delightful end residence has exceptional natural light and volume ceilings! The lengthy Lanai offers superb outside dining, happy hour entertaining or simply a good place to nap. Set up for the vacation minded guest, this very nice 3-bedroom, 2 bath is complimented by the amenity rich community of Bonita Village. The main living area features a big flat screen TV, porcelain tile floors, crown moldings. The granite kitchen is very well equipped and Master Bath offers a Roman Tub, separate shower, private commode and dual sinks. Laundry room, pantry, and lots of closet space makes for easy living. This is poolside living at its best! To book your stay 'Just Call Pat' at 239-707-9163.